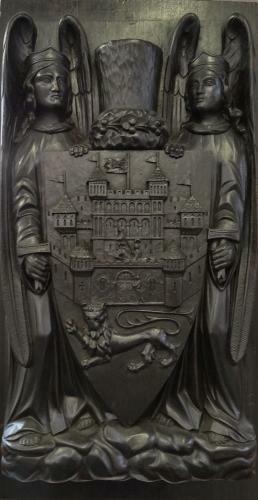 A rare carved ebonised oak panel by the important architect-designer Thomas Jeckyll (1827-1881); mid-19th C.
Depicting a pair of sword wielding angels supporting a shield, surmounted with a thistle flower over a fortified house, to a lion passant; representing the coat of arms of the City of Norwich in Norfolk, England. h: 25” w: 13” d: 2.5” max. This was produced by Barnards Ltd, iron founders of Norwich (previously known as Barnard Bishop and Barnard) and was possibly used as a mould or simply as an exhibit/example for one of the cast iron panels in the reverse aspect of the “Norwich Gates” at Sandringham House, the Queen`s country residence in Norfolk. The actual cast iron panel is on the base of the inside of the gates, right hand pillar (see actual in situ last image). The carving, by repute, has come from a family member who had worked at Barnards “Blacksmiths & Foundry” at the time; thence by descent. The Norwich Gates were designed by Thomas Jeckyll, and made by the Norwich iron founders Barnard, Bishop and Barnards. They were presented as a wedding gift by the people of Norwich to the then Prince Albert Edward & Princess Alexandra of Denmark at the time of their wedding in 1863. A very similar (and near identical) rough plaster cast panel is held in the collection of the Norfolk Museum and Archaeology Services in Norwich (see penultimate image). In the museum example, the faces of the supporters are slightly more outward looking. The plaster cast is inscribed on the back as being made for the “Sandringham” Gates. The last image is of the relevant section of the gates themselves. For further ref see “Thomas Jeckyll Architect and Designer” by Susan Weber Soros and Catherine Arbuthnott, chapter six. My thanks to John Renton, Collections Curator at the Norfolk Museum & Archaeology Services in Norwich and also to Helen Walch, Public Enterprises Manager of the Sandringham Estate for their assistance with the research information.